SpreFix G absorbes moisture faster than mineral wool and cellular plastics. SpreFix G is white in its natural colour and is rated Non-Combustible material, Chapter II-2 of 1974 SOLAS Convention as amended; IMO Resolution A.472(XII) by Lloyd's Register of Shipping. SpreFix G is a lightweight material, density 45~50㎏/㎥. and is used for sound absorption, condensation control and thermal insulation in areas where a lightweight material is requested. value, and when considering that no thermal bridges appear after application because of adhesion to the surface, it is then superior to other material. Railway carriages in Sweden and Finland are completely insulated with SpreFix G, as are naval vessels in Sweden. In Sweden we have insulated over 1200 carriages during a period of ten years. Many carriages have been examined after fire damage and reconstruction, and there have been no complaints on the performance of SpreFix Insulation. 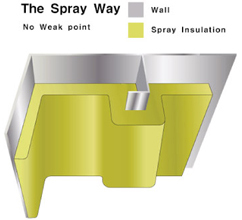 Not only will SpreFix provide thermal insulation but also sound absorption and condensation control. problems of acoustics in ships, and buildings. The material will allow you to spray on any substrate of any shape and still achieve a nice interior design. The surface can be painted and given different surface structures to customer's choice. to contain large quantities of water vapor, and release the vapour without any damage to the insulation or to the adhesion to the substrate. This means that SpreFix insulation is able to minimize damage to substrate and constructions by 'controlling' the humidity, which is one of the basic ingredients causing rot and corrosion. This is a big problems with other materials currently in use, such as insulation panels, where water vapor gathers and results in damage to the insulation and the substrate. The diagram above shows how the materials absorb and emits water vapor. The curve of SpreFix tells us that there will never be any accumulation of vapor in the material and therefore not causing rot or corrosion. Fire protection is probably the insulation form that raises the highest demands on the material and the method of application. Steel construction is one of the areas where SpreFix is of great advantage. No mechanical fastenings are needed and there are no seams that will have a negative impact on the fire resistance. No other tested system, where only rock wool and polymer binder and used, exists on the world market today. SpreFix S, density 150㎏/㎥ is grey in its natural colour and has the same qualities as SpreFix G in sound absorption, condensation control, and thermal insulation, but is used where a fire rating is needed. SpreFix S is used as fire protection in almost any application : such as in steel construction, offshore installation, lead-through in fire walls and turbine insulation, for ceilings, duct insulation, and angles of roofs. But especially in the offshore environment SpreFix is well ahead. SpreFix S has been approved as fire insulation, A-60 Deck and Bulkhead, by Det Norske Veritas(DNV), IMO Resolution A.517(13). 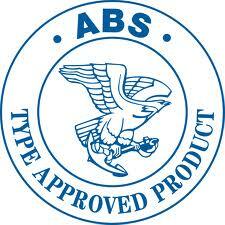 SpreFix is tested according to IMO/ISO-regulations which have tougher criteria than BS/ASTM. The diagram shows the fire resistance values for different steel constructions at a steel temperature of 450℃. 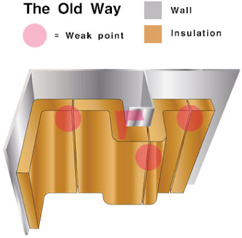 Eliminating the weakest points on the insulation system. As for the fire protection in the marine and offshore sectors, one of the toughest industrial environments in the world, SPREFIX SPRAY’s solution fulfils every single requirement stipulated by regulating agencies anywhere. ·For the thermal and soundproof type.